Discussion in 'Cricket Talk' started by Ahson8, Jan 22, 2017. 'Turmoil'. If there was one word that could sum up the Karachi Kings' campaign last year, that would be it. No matter who they tried at the top of the order, they failed. Their captain stepped down from the helm midway through the tournament, they lacked the firepower down the order to finish off games, and key players such as Malik and Imad went missing throughout the tournament. Somehow, they managed to win two games vs the Qalandars, and made it to the 2nd qualifying final, where they were predictably sent packing off by Islamabad United. This year, they have definitely attempted to rectify those issues, as can be seen by the changes in their squad. Squad : Kumar Sangakkara (c), Chris Gayle, Shoaib Malik, Kieron Pollard, Mohammad Amir, Ravi Bopara, Imad Wasim, Babar Azam, Ryan McLaren, Sohail Khan, Shahzaib Hasan, Saifullah Bangash, Khurram Manzoor, Kashif Bhatti, Abrar Ahmed, Abdul Ameer, Mahela Jayawardene, Usama Mir, Rahat Ali, Ammad Alam. First up, Sri Lankan veteran Kumar Sangakarra has been brought in to lead the side. While Sangakarra was a good tactician, and a fantastic wicket keeper batsman in his hay day, his recent form will be a cause of concern for the Kings. Kumar was in terrible form for the Hobart Hurricanes in the BPL, and was dropped from his side midway through the tournament. Still, there is no doubt that in these conditions, he still has the skillset to dominate the opposition bowlers. Chris Gayle has been brought in, in an attempt to solve Karachi's opening woes. The opening is something that the Karachi management would definitely have talked about, and that is why they have recruited hard hitting West Indian opening batsman Chris Gayle. While Gayle can definitely take the game away from the opposition when on song, he is known to be inconsistent and is fairly weak against spin, and on Asian pitches, and he therefore may not provide Karachi with what they are looking for. The management will be hoping that he can find his form and provide the side with blazing starts. Kieron Pollard will be tasked to provide the late order impetus for the Kings. Finally, lower order hitting was also one of the worries for Karachi last year, which is why Kieron Pollard has been brought in. Once again, the caveat here is that Pollard may struggle in these conditions. Still, with the likes of Gayle, Sangakarra and Pollard, Karachi look a stronger outfit than they did last year. Like last year, the Kings have stacked their team with an array of allrounders, including the likes of Shoaib Malik, Imad Wasim, Ryan McLaren, Ravi Bopara and Kieron Pollard. This should help them give a good balanced combination, and give them depth with both bat and ball. The PSL has a policy that all teams need to pick atleast one 'emerging' player in their XIs, and Karachi have opted for some inexperienced names, such as Abdul Ameer, Abrar Ahmed and Ammad Alam, and their manager boasted that we have selected the youngest player in the draft. While it seems good to give opportunity to youth on paper, Karachi should remember that they have to play atleast one of these players in the XI, and if they don't fire, they could find themselves in some trouble. One of the talking points about the PSL trades was Islamabad United trading Babar Azam to the Kings. The young batsman has been in terrific form throughout 2016, and became the joint quickest player to 1000 ODI runs just recently. He didn't have a great tournament last year, but there is no doubt about his talent, and the Kings will be hoping that he can showcase it this time around. Another key player would be Ravi Bopara. The allrounder ended up as the second highest run scorer and the fifth highest wicket taker last year and also recorded what were at that time the best ever bowling figures in a T20 match: 6/16 vs the Lahore Qalandars. Could Shahzaib Hasan be the solution to Pakistan's batting woes in ODIs ? It's been some time since Shahzaib last featured for Pakistan. The opening batsman was part of the victorious WT20 squad in 2009, and played a few games afterwards, but was eventually dropped. Shahzaib was in good form in the National T20 cup, where he scored 344 runs in 9 games, with 5 fifties to his name. Considering that Pakistan is looking for hard hitting batsmen for the ODI outfit, Shahzaib could earn a recall if he manages to bring that form to the PSL. Another players to keep an eye on would be legspinner Usama Mir who will be returning from injury. Usama impressed Karachi Kings' coach Mickey Arthur last year, and will be looking to do so again this year. After a poor campaign last year, the Kings have looked to strengthen their side with big names like Sangakarra, Chris Gayle, Babar Azam & Kieron Pollard. They have some fine allrounders and good pace options in Sohail Khan and Amir, as well as some decent spinners in Usama Mir, Imad Wasim and Shoaib Malik. They look a better outfit than last year's but the major key to their success will be if Gayle and Pollard are able to find form in spinning conditions. Otherwise, they could well end up with another disappointing campaign, despite having a good side on paper. Strong all round team, bat deep. Strong unit but their big names have to click otherwise we might see them struggling like last year again. 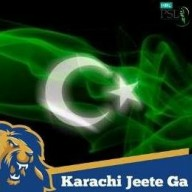 Dont know why bit find it really hard...impossible in fact to like Karachi. Last year they were a completely unlikable team. Not sure why Usama Mir was picked as supplementary, he could have fit in there easily. The babar trade never took place. That was all made up. If trade took place, then iftikhar ahmed should had come over to our squad, but this never happened. He was not retained by Islamabad united and that was a very good decision. He is not a good batsmen, shaun tait made him look like a fool. He is not a good batsmen, shaun tait made him look like a fool. So just because he didn't look the part in 1 game in PSL, he isn't a good batsman ? International runs don't account to anything ? So just because he didn't look the part in 1 game in PSL, he isn't a good batsmen. He played 2 games. In one game he threw his wicket away after 3-4 dots. He made the same mistake in the second chance. Failing in 2 games doesn't make him a poor batsman either. He's been scoring runs for Pakistan in LOIs and that's what matter. Plus, he averages 40+ in domestic T20's and was the top scorer in PAK v WI T20Is so he can play this format too. Best team mA. even @Red Devil is a closet supporter. Best team alongside Qalandars imo. Nah, they traded Babar for the 2nd pick in the supplementary round. Basically it was Babar for Duckett. Yes Qalandars was hard done by other teams last time. They all played better unfortunately otherwise it would have been Qalandars all the way. We have some dhokaybaaz fans like @saiyan0321 too who run away somewhere else after a bad season. The guy has become a disgrace to SKP tbh. Just too much decency in the middle order. Good team this time around. Expecting them to perform better than the last year but for them reaching the final wont be easy. The squad does not have good depth. It's hard to like anything that comes out of that soul-less city. Case in point, @Wistful Reminisces is from there. Lulz, half the city didn't like them, imagine trying to support Shoaib Malik. Or Sohail Tanvir. Then realise they're both in one team. Main ne kya kiya hai ? The template that Karachi wanted to follow last season was the correct one, however their execution of the said strategy was God Awful and it didn't help that most of it's picks were going through some severe slump of form. We had Shahzaib back then as well, but he wasn't in the greatest of nick which forced us to back Nauman Anwar at the opening slot as Karachi wanted him to play a Sharjeel type of role. However, disappointingly Nauman failed to make any sort of impact which meant that there was a lot of pressure on the Middle order. Imad and Malik went missing all throughout the tournament and the only real two contributors were Amir and Bopara. This time around however, we have Sanga to depend on even if let's say Shazaib and Gayle aren't able to do their things while that would also mean that Mian Malik and Imad can play a more aggressive sort of role since the batting won't be too dependent on them with the induction of both Bopara and Sanga. At the very least we should make the final, otherwise I would be massively disappointed !! All look hunky dory except choice of captain. I understand it could be a bit adventurous but this is the ideal stage and platform to groom and produce new captain for Pakistan. Ideally Imad Wasim should lead the side and Sanga can be his deputy - a shadow captain. Same notion which Quetta introduced in PSL1 where KP was shadowing Sarfu who led his side to the finale. PSL could be a near perfect phase to mature half baked players under the guidance of mentors like McLean, Sanga and KP. Jam packed stadiums, crunch moments against tough opponents, immense pressure to test ones cricket acumen. Could be a blue print to success for young lads. That said, the right balance of indulging not more then 4 foreign players in imperative. No point if a side would've top 4 slots filled with foreign players - maybe good for franchise but not for Pakistan cricket. Finding the right balance in the need of the hour. So 2/2 (2 batter, 2 ballers) should be ideal. To me this is a moot point. It will do no good to Pakistan cricket if you've 6 foreign players playing on keep spots (i.e. opening, no3, 4, 6 and opening the bowling with Amir).